Don’t you just love it when you go to the effort of preparing a lovingly home made meal for your toddler and they literally spit it back on their plate? Oh the joys of parenthood, apparently. 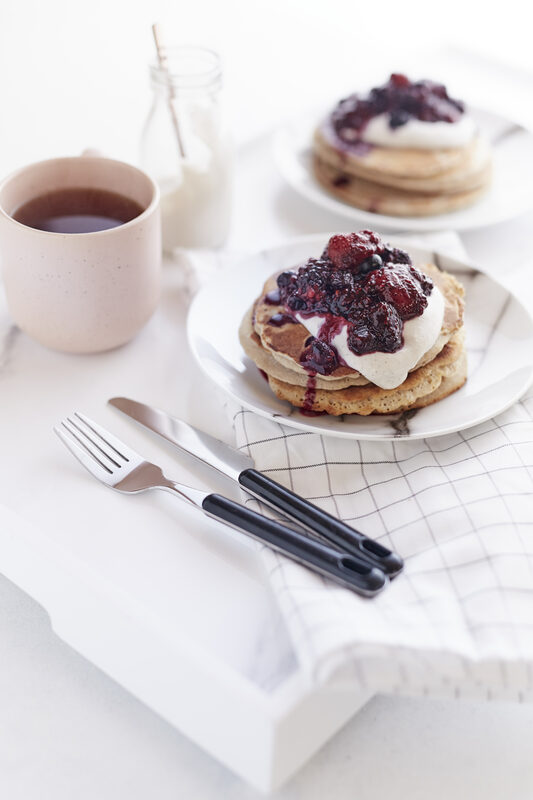 This happened to me on Sunday as I had a hankering for berry pancakes so decided to whip up a batch of oh so simple but totally delicious and café-worthy buckwheat pancakes with quick berry compote. Despite what I thought was a drool worthy breakfast, Harlow decided she doesn’t like pancakes and instead picked off the berries like a little bird. Getting Harlow to eat breakfast, aside from her mandatory ‘milkies,’ is difficult. I think the milk is the problem as it fills her up and then doesn’t want to eat, but who can be bothered dealing with the toddler meltdown when I refuse to give her milk in the morning? So she tends to scrape by on berries, maybe some yoghurt or cheese, until she’s famished by lunchtime! This recipe is so simple and is inspired by my favourite breakfast at the Komune in Bali where I ran my wellness retreats earlier this year. If you have experienced the buckwheat pancakes at the Health Hub you know what I am talking about. I wanted to eat them every morning of my stay there, but there were too many amazing other things to try so I felt too bad ordering the same thing too much! I was determined to recreate them, sans lush tropical surroundings, back at home. The result is pretty fantastic, despite what Harlow might say. Buckwheat flour is readily available these days at your supermarket, health food or wholefoods shop. It’s really versatile flour that makes great muffins and cakes and is naturally gluten free and high in protein, fibre and minerals so it’s an awesome alternative to plain old white flour. 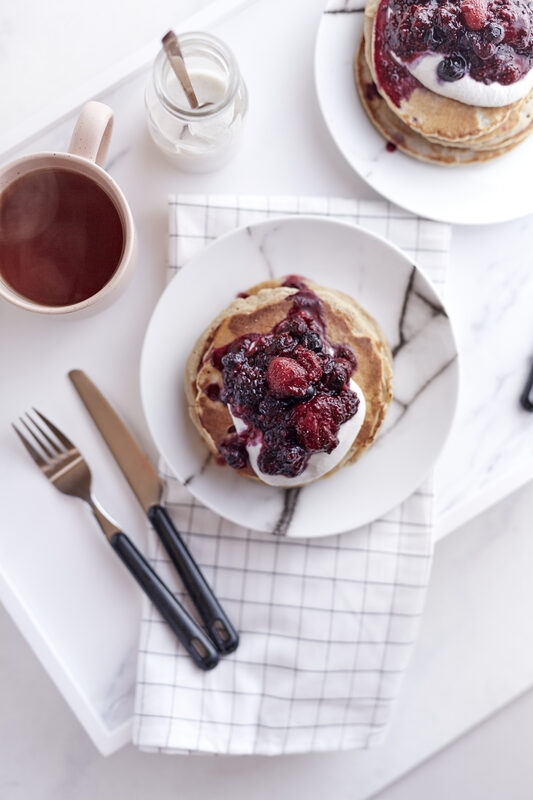 For anyone looking for a healthy but still incredibly tasty pancakes breakfast, you must try this recipe. And ignore my fussy toddler. Enjoy! Pop the frozen berries straight into a small saucepan over low – medium heat with a teaspoon or so of water. Allow berries to defrost and become a little jammy, add maple syrup if using. When thickened slightly, turn off heat and allow them to cool a little. 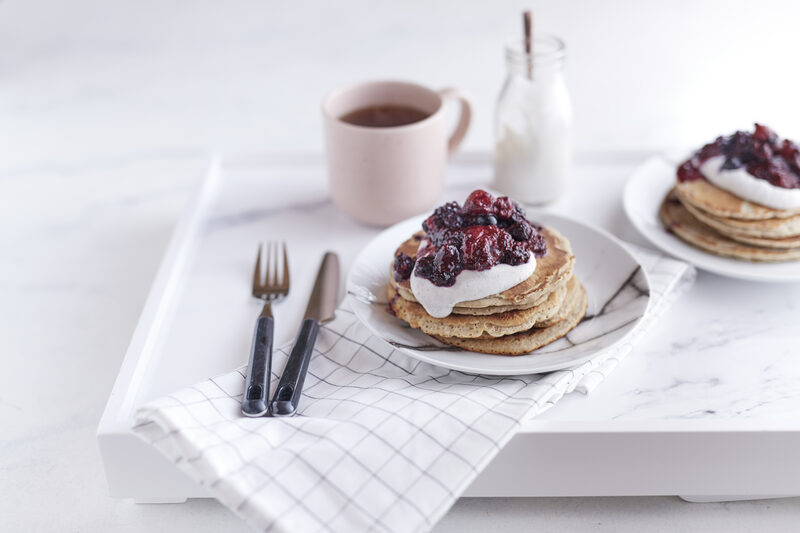 To make your pancakes, place the dry ingredients in a large mixing bowl – buckwheat flour, baking powder and coconut sugar if using and give it a good mix to combine. Then in a different mixing bowl, whisk together the wet ingredients – eggs and milk. Pour the wet into the dry and give it a good mix. Mix together the coconut cream and vanilla so that it’s nice and smooth, if it’s really thick, add more water so it’s the consistency of thickened cream or yoghurt. 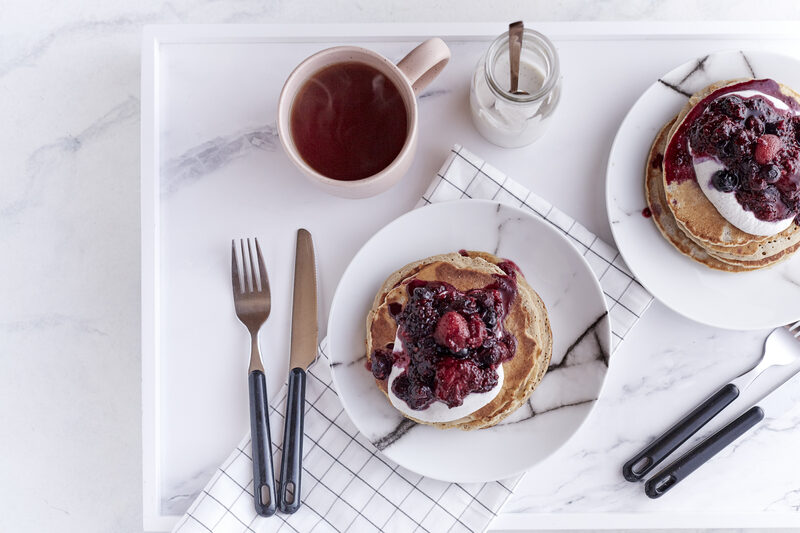 Place large non-stick frypan over medium heat, add two teaspoons of oil to the pan, allow the oil to melt then add about ¼ cup of pancake batter to make one pancake. Depending on the size of your frypan you should be able to cook the mixture in two rounds of cooking. When small bubbles start to surface in the batter of your pancake, gently flip it over and continue cooking for a further minute or so. Remove from pan and set aside, cooking the remaining batter. 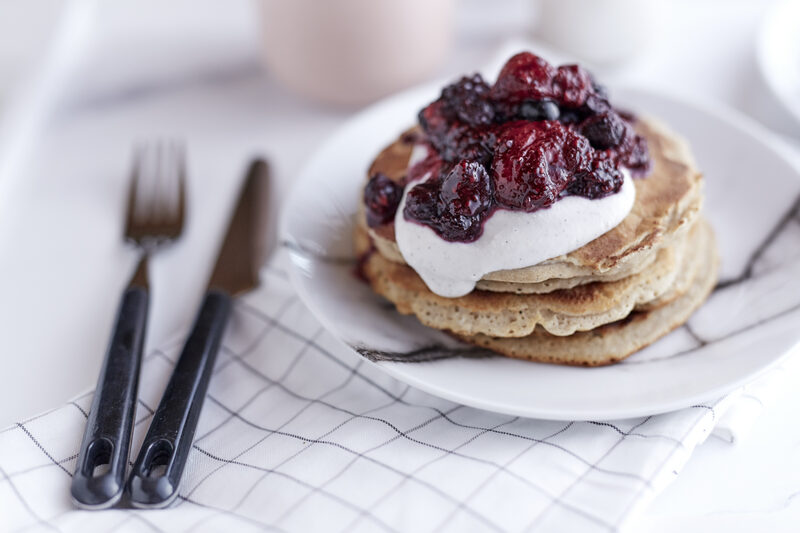 Serve warm pancakes with vanilla coconut cream and yoghurt and top with berry compote and pretend you are poolside in Bali.